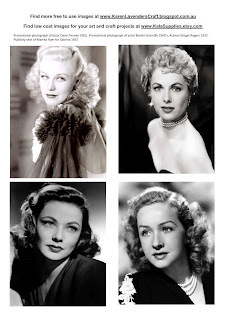 Heres todays great new royalty free vintage digital photographic image of four movie stars. There's actress Ginger Rogers 1937, publicity shot of Martha Hyer for Sabrina 1957, Promotional photograph of actor Gene Tierney 1963 and a promotional photograph of actor Bonita Granville 1940’s. Great to use in your digital scrapbooking or art and craft projects.